Whole Cottonseed has energy, protein and fiber in greater concentrations than many other feedstuffs. That’s why it’s recognized by dairy producers nationwide as a cost-effective premier feedstuff for lactating cows of high genetic merit. In fact, more than 50% of the annual supply of whole cottonseed is consumed by dairy cattle. Producers have found that whole cottonseed is ideal for mixing with less nutrient-dense feed ingredients. The result is a competitively priced, balanced ration. Will Cottonseed Work for You? Dairy producers of all sizes are effectively using whole cottonseed (WCS), especially in the diet of the early-lactation cow. WCS can increase milk output and boost butterfat. That’s why many producers build their herd’s diet around the valuable nutrients of cottonseed. WCS is convenient and does not need to be processed before feeding. Since WCS should be mixed with other components of the dairy cow diet, producers with large herds buy WCS in bulk and add it to their total mixed ration (TMR). Small herd owners ask their feed dealer to include it in their pre-mix. On average, a truckload of cottonseed weighs 23 tons, enough for 100 cows for 100 days. Whole cottonseed has high protein (23%), high energy in the form of fat (20%), and crude fiber (24%) on a dry matter basis. Compared with other commonly available protein supplements, whole cottonseed is the only one with both additional high energy and high fiber. This combination is especially attractive when feeding the high producing, early lactation dairy cow in negative energy balance – a cow in need of both energy and fiber. Also, the energy (fat) content of WCS makes it a valuable addition for cows under heat stress who may have a reduced appetite. WCS has a value similar to a 20% protein mixture of corn and soybean meal, making it worth around $250/ton with current feed prices. Whole cottonseed has a good balance of crude protein and energy, so it makes a complete supplement in many situations. The “crude protein” in WCS is “true protein” which makes it better for supplementing high forage diets compared to supplements with non-protein nitrogen (urea). The energy in WCS is primarily from fat, which if fed at a reasonable level, won’t interfere with forage digestion the way the starch in corn can. Research has also shown that the fat in WCS improves reproductive performance. Adding WCS to the diet of early-lactation dairy cows usually increases total energy intake, which often boosts milk yields. And WCS usually has a positive effect on milk fat test, while slightly reducing milk protein. Overall, the effect on milk price is positive. If you’re using a computer program to evaluate the dollar value of WCS in your cows’ feed, make sure it includes WCS’s positive influence on milk production and milk price. Feeding 5 to 8 pounds of WCS per cow per day is generally regarded as economical, effective, and safe. (Five pounds is approximately 25,000 seeds.) If greater amounts are fed, careful calculations of gossypol intakes based on the whole seed analysis should be done, especially if more than the recommended amount is fed for extended periods. Cotton is the leading cash crop in the United States and more than 50% of the WCS produced each year is sold specifically for livestock feed. Of this amount, about half is distributed by companies associated with cottonseed oil mills, and the other half enters the feed trade directly from cotton ginners. As with corn, soybeans and other feedstuffs, traditional forces of supply and demand determine the price of WCS. Marketers of WCS include commodity dealers, brokers, feed dealers, truckers and others; and distribution channels continue to evolve every year. In the past, some mild swings occurred in the WCS market, largely the result of inadequate storage capacities, particularly in the Southeast and the West. But as storage capacities increased, price and availability of WCS stabilized. And as more storage capacity has been created throughout the country, the market has become increasingly reliable. To find a source near you, visit the Cotton Incorporated Web site, www.wholecottonseed.com or call 800-334-5868. You can also visit www.cottonseed.com. Purchasers of feed grade WCS are advised to deal only with reputable distributors and merchandisers who are experienced in the business of storing and handling WCS. The true economic value of WCS can only be established by its use in your individual dairy situation. Here is a suggested starting point for your calculations. 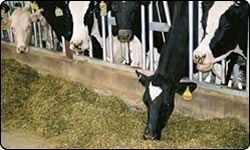 The dollar value of any feed ingredient should reflect the nutrients it contains relative to the cost of nutrients in other available feedstuffs. The most comprehensive way to do this is with a computer that solves simultaneous equations given an array of available feedstuffs and their costs. However, these programs often have limitations, especially in the case of special ingredients, such as WCS, which supplies energy in the form of fat, plus protein and a digestible fiber. Also, the use of WCS will often increase milk fat test, although a small depression in milk protein often occurs. The net effect on milk price, however, has usually been positive. This means that the value of WCS is often more per ton than a least-cost computer formulation that ignores milk revenues. A good Coastal Bermuda grass hay (CBH) to represent the value of fiber. Use the values in the following formula. This value incorporates the contribution of fiber, which is crucial to the producing cow in the first trimester of lactation. During the last half of lactation, fiber is usually not a constant, and the value of fiber in the formula should be discounted by at least half. The type, amount and quality of your homegrown forage must also be considered. One very important logistical advantage in using WCS is a reduced number of feed ingredients – the high nutritional quality of WCS often reduces the total number of other feedstuffs needed in the ration. Thus, farmers require less ingredient storage and less management time spent with purchasing and inventory control. 23% CP Alfalfa 15.8 lbs. 48% Soybean Meal 3.9 lbs. 23% CP Haylage 33.0 lbs. 23.6 lbs. 24.0 lbs. Dried Citrus Pulp 10.0 lbs. 10.0 lbs. 10.0 lbs. Cottonseed 8.0 lbs. 8.0 lbs. 8.0 lbs. 48% Soybean Meal 7.6 lbs. 6.3 lbs. 3.5 lbs. Haylage 35.5 lbs. 12.3 lbs. Corn Silage 32.3 lbs. 57.0 lbs. Rolled Corn 14.5 lbs. 7.3 lbs. 44% Soybean Meal 10.5 lbs. 11.0 lbs. Whole Cottonseed 3.3 lbs. 0.0 lbs. 23% CP Haylage 32.0 lbs. 48% Soybean Meal 9.5 lbs. 48% Soybean Meal 3.8 lbs. When WCS is a particularly good buy, a reasonable question is: how much can one feed? Most dairy producers in the South and West feed from 5 to 8 lb. per cow per day. This is about 15% of the total diet dry matter in a TMR. But if fed for extended periods (more than 6 months), producers need to be aware of the safe levels of a compound called gossypol. Research conducted at Auburn University suggests that 24 grams of free gossypol is the approximate upper limit for the lactating cow, allowing up to 10 lbs. of WCS per cow per day if the free gossypol is 0.50% or less in the whole seed (22.7 grams). A gossypol analysis is recommended to determine the exact amount of free gossypol if feeding more than 8 lb. of WCS per cow per day. Analyses are usually expressed as a percentage of the kernel (meal plus oil); to convert the percentage of gossypol in the kernel to the percentage present in the whole seed, multiply by .68. For example, if a kernel contains 0.92% gossypol, the equivalent amount in the whole seed would be 0.63%. If cottonseed meal and/or cottonseed hulls are also being fed, their contribution to the total free gossypol intake needs to be included also, though they may have much less free gossypol than WCS. 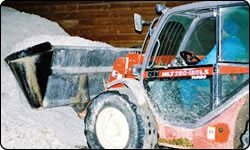 Whole cottonseed, as with many other feedstuffs, may have problems with aflatoxin produced by molds, developed in either the field or from poor storage of the cottonseed. Purchasing agreements should state clearly that the WCS have less than some specific amount of aflatoxin (20 ppb is the legal limit for feeds used in dairy rations). Storing WCS on a well-drained pad protected from rain is a necessity. The bulk density of WCS averages about 22 lb./ft.3 and requires about 80 ft.3 of storage space per ton. WCS is hydroscopic and therefore absorbs moisture from, or gives up moisture to, the surrounding air. Storage temperatures below 60ºF (15ºC) and below 10% moisture content wet basis provide the best conditions to avoid developing molds and reduce insect activity within the seed. Whole, fuzzy cottonseed has some unique characteristics requiring special attention when using common grain-handling facilities. Unlike grain, WCS has a variable angle of repose. The angle of repose in an unrestricted pile of WCS is about 45º. However, after the seeds have settled, they will bridge – an indication that the angle of repose is greater than 90º. Extreme caution must be exercised when handling large volumes of WCS to ensure that hazardous situations do not jeopardize worker safety. As with feedstuffs such as corn and soybeans, WCS should not be stockpiled for extended periods unless you are thoroughly familiar with proper storage conditions and aeration systems. Over many months of storage, WCS will retain its greatest value under conditions where it is covered and air is drawn through the pile to reduce and control the temperature and moisture level. If you wish to have a guaranteed supply of WCS for several months of a year, it is recommended to forward contract for future delivery. This places the responsibility of proper storage on the supplier. Several feed suppliers have recognized the many benefits of feeding whole cottonseed. These suppliers have developed specialty products to better meet the needs of the often widely different feeding practices of dairy producers. One of these products is EasiFlo™ cottonseed. EasiFlo uses a starch coating to improve handling and flow while enhancing whole cottonseed’s ability to be augered through traditional grain handling equipment. CottonFlo™, another specialty product, increases nutrient density and flowability. And a pelletized form of whole cottonseed, known as FuzZpellet™, has recently been developed. To learn more about any of these specialty products, visit the Cotton Incorporated Web site. The NCPA is a national trade organization that represents cottonseed crushers, WCS merchandisers, dealers, brokers, chemists, and other allied interests. Rule F-4: Prime Feed Grade Cottonseed. Prime Feed Grade Cottonseed shall meet the following criteria: Foreign substances shall not exceed 2 percent. Moisture shall not exceed 13 percent. Free fatty acids in the oil shall not exceed 3 percent. Crude protein and crude fat (dry matter basis) will be at least 34 percent when the separate totals for each are combined. Cottonseed of the Pima variety or other varieties of long staple cotton containing 3 percent or less residual lint on seed after ginning, or admixtures containing such seed must be identified as such at the time of sale. Rule F-5: Delinted Prime Feed Grade Cottonseed. Delinted prime feed grade cottonseed shall be mechanically delinted. Lint on seed shall not exceed 5 percent. Foreign substances shall not exceed 1 percent. Moisture shall not exceed 13 percent. Free fatty acids in oil shall not exceed 3 percent. Crude protein and crude fat (dry matter basis) will be at least 37-1/2 percent when the separate totals for each are combined. Rule F-6: Feed Grade Cottonseed, Off Quality. Feed Grade Cottonseed, off quality, are those that do not meet the specifications of Rule F-4. Cottonseed – Determined by the National Cottonseed Products Association (NCPA), Premium and Prime Feed grades contain, respectively; 1 to 2 percent foreign matter; 11 to 13 percent moisture; 38 to 34 percent crude protein and crude fat (combined totals for each); and 3 percent free fatty acids in the oil. Delinted Cottonseed – There are two processes used for delinting cottonseed, mechanical and acid. Mechanically delinted is the most common form of delinted seed available in the feed trade. Mechanically delinted seed retains about 1-2% residual linters which usually appear on the ends of the seeds. Acid delinting is a process that completely removes all linters. This process is used for the production of planting seed. At certain times during the year, quantities of culled, or leftover planting seed, become available to the feed trade. Beware of such planting seed unless you can demonstrate that it does not contain chemical seed treatments. Gossypol – A polyphenol ( C30 H30 O8 ) derived from the cottonseed plant and potentially irritating to gastrointestinal tract. Lint – The ginned fibers from harvested cotton bolls. Linters – The short fuzz left on the cottonseed after a mechanical delinting process. NCPA – National Cottonseed Products Association – The NCPA is a national trade organization representing cottonseed crushers, dealers, brokers, chemists, and other allied interests within the industry: www.cottonseed.com. Pima Cottonseed – This is the seed from pima varieties of cotton, also known as extra long staple (ELS) cotton. It represents a small percentage (about 2%) of U.S. cotton. Pima seed is genetically devoid of linters, the fuzz that covers the seed of upland varieties. Some nutritionists recommend that Pima seed be cracked prior to feeding. Whole Cottonseed (WCS) – This term refers to fuzzy seed from upland varieties of cotton.